Associate Professor of Biology Engda Hagos and seven current and former students have co-authored an article that was recently published in the journal Cell Communication & Adhesion. The paper, titled “Krüppel-like factor 4 mediates cellular migration and invasion by altering RhoA activity,” explores cancer cell invasion. Invasion and metastases are a spreading of cancer cells from one organ to another in the body. Invasion, and the subsequent formation of secondary tumors, is the leading cause of death in cancer patients. The seven co-authors of the paper range in years at Colgate. Philip R. Brauer ’18 studied at the National Institutes of Health (NIH) with Professor Hagos last fall. Brauer plans to attend medical school. Jee Hun (Henry) Kim ’18 also studied at the NIH with Hagos and was accepted to eight graduate schools. He will start his PhD in cancer research at Columbia University in the fall. Humberto J. Ochoa ’17 was an OUS student who worked in the lab with Hagos for the past two years. He currently conducts research at the National Cancer Institute. He plans to attend graduate school next year. Elizabeth R. Stratton ’17 plans to attend medical school. William Rosencrans ’19 will be going to NIH in the fall 2019 semester. Eliza Stacey ’17 is working as a medical assistant at a neurologic institute gathering work experience before she applies to physician assistant’s schools this summer. Kathryn M. Black ’15 is an MD candidate in the Class of 2019 at Tulane School of Medicine. 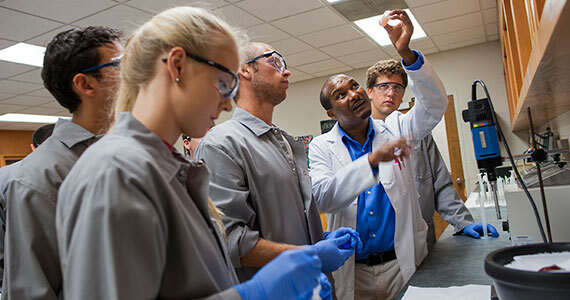 With small class sizes, Colgate students have the opportunity to research directly with faculty.